When you’re imagining a new game, you’re probably thinking about its clever mechanics, its dynamic world and characters, and its gorgeous art. It can be easy to forget about your players. And I don’t just mean their experience with the game, because as a game designer, your responsibilities don’t end there. You should consider the context in which your game will be played: the social and physical settings, what is appropriate and realistic in those settings, and whether your game will fit naturally there or not. I started to explore issues of game context in my first Board Game Design Basics series about time, and today I want to expand on that. I’ll be covering some of the physical and social constraints of board games. Why worry about this stuff? It’s certainly not the most fun part of designing a game. But if you’re serious about designing games, these issues will come up sooner or later, and it’s much better to be prepared for them than to let them surprise you. If you don’t plan for them, you might not discover a serious problem until you have already dedicated a lot of time to your game. Plus, you will need to playtest your game as much as you can, and you will want to show your game off to as many people as possible. Knowing when a playtest or demonstration is destined for failure can avoid awkward situations and wasted time for everyone. Most of my advice about this comes from direct experience and hard lessons learned–I certainly did not consider these issues at all when I began designing games! Most games have expected play time written all over the box. It’s useful information both for potential customers and people trying to find a game to fill a few spare minutes or a whole evening. But you’ll also find the number of players on the box, which is at least as important. Most games are played by people in groups, and all games have limitations on how many people can play, so it’s important to be able to quickly tell if a game is appropriate for a particular group. As a designer, it’s worth thinking about your target audience. How many people do they play games with? Make sure that range is covered. Almost all games are played in groups. These authentic gentlemen might not be able to enjoy this thrilling game in settings with additional people. Image from Vat 19. Obviously, the wider range of players a game can handle, the better, but creating inclusive games is very challenging. Making a game for two players is much different from making a game that three people can enjoy, and accommodating both is very difficult. 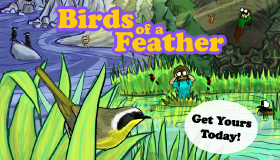 Each number of players handled adds extra constraints to the design and can require more work for players to set up, which you want to minimize. You should consider the social settings in which your players will play. The first board game I dedicated a lot of work on, Ideological Empires, was designed for two players only, and I was discouraged when it was difficult to find opportunities to playtest it. I explicitly set out to make my next big project, Corporate America, more accommodating to groups of people, but it can’t handle two players–of course, when I asked people on Board Game Geek why they weren’t supporting the game’s Kickstarter, someone said he rarely plays games with more than two players. Another surprise as I worked on Corporate America was the noise factor. 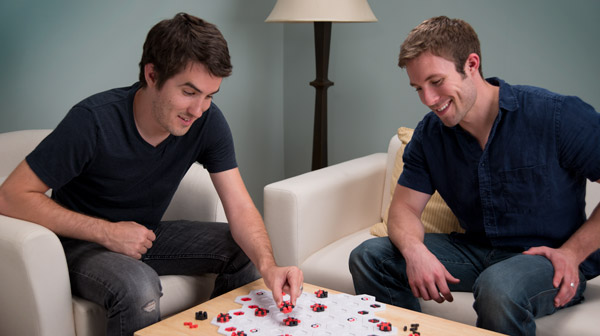 Many traditional board games like Chess and Go are notoriously cerebral and are therefore very quiet aside from the occasional trash talking. On the other end of the spectrum, games like Taboo and Pictionary are all about lively verbal communication and are therefore quite noisy. In the middle are a range of games where social interaction plays some role, if not the dominant one. Different games are appropriate in different settings due to the amount of noise they produce. You can easily get away with Chess in a library, and probably even Poker, but once you start moving into Apples to Apples territory, your game might be getting your players into trouble. Even some game stores may not make the best environment for games that get noisy. 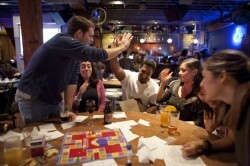 Even though some bars are board game friendly, that doesn’t mean your board game will be bar friendly. Image from Fun Cheap SF. On the other hand, settings that are noisy themselves, such as parties or bars, might not allow the communication necessary to play noisy games (or the concentration necessary to play more cerebral games). That said, games can be designed specifically for environments like this. I was delighted to discover that Incan Gold (originally released as Diamant) fit this role (whether or not it was designed for it) at a very noisy and very dark GDC party a couple of years ago. When I conceived of Corporate America, I was thinking about friends hanging out at someone’s house, or possibly a small party scene. The game works great in these settings (assuming players have enough time and can dedicate some attention), but I’ve found it can be difficult to play in environments with a lot going on, or when players have to hold back from getting excited about the game. Another consideration is how formal the social setting is. Corporate America encourages players to crack jokes and get a little ridiculous, especially when it comes to the president wearing a silly hat. In some settings, this sort of behavior is inappropriate, and in some social situations players might feel too self conscious to participate. Maybe social satire is a bit of an extreme example, but I’m sure we can all remember a social situation where being passionate about even mainstream game topics (such as science fiction or fantasy) resulted in embarrassment. You should also consider the spacial requirements of your game. Games can range from a few piles of cards to sprawling maps, books, miniatures, and sheets of notes. If you think about games more broadly, many sports require huge areas to play (think Golf). How much space will your game take up? Could you play it on the average kitchen table? How about a kitchen table that’s half covered in another game or junk mail? Ideally, you want to keep your play area small so the game can be played in more settings. It can be quite frustrating when someone wants to play a game but can’t for lack of space, which can definitely be an issue at crowded conventions, in public places, or in cramped apartments. If your game does require a lot of space, playing on the floor is always an option, though keep in mind that in many spaces this is socially awkward or hygienically questionable. It can also introduce unexpected complications: Corporate America requires players to look at icons on other player’s cards, which is easy to do when cards are resting at belly height (when lying on a table you’re sitting at), but can be difficult when cards are at seat height (when resting on the floor). Of course, games not only take up space when they’re being played. They also take up space when they’re in storage. Here, minimizing volume isn’t necessarily best, since you don’t want players to accidentally hide or lose your game. However, keeping the volume down is generally a good idea to allow for convenient storage. If you keep your game small, it’s also easy to transport, and may sneak its way to a game night when there’s only a little space left in someone’s game bag. The Bang! bullet: pretty cool, until you try to fit it on your game shelf. Image from iguk. One definite recommendation I have for you, though, is to make sure your game stacks nicely and fits into common storage areas such as book cases. 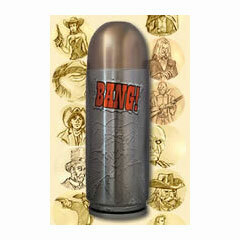 A game like Bang!, which comes in a cylindrical bullet, may seem fun and appealing in the store (and may generate more sales because of it), but I’ve met many people who lament the awkward shape that ultimately becomes more tacky than enduring. As a game designer, you owe it to your players to consider more than just the fun-to-design aspects of your games. Sure, coming up with interesting mechanics and storylines is a blast, but a game is more than that. A game is a way to bring people together. It’s a social experience. And you need to make sure your game is serving the social needs of your players. Make sure your game is appropriate to play when and where your players want to play. Make it as easy for them as you can. Remember that expanding the social and physical settings in which your game is appropriate means your game will likely be played more. You do want your game to be played a lot, right?